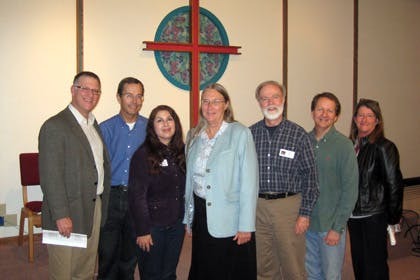 January 18, 2012 | 1:22 p.m.
Bethel Seminary San Diego hosted Susan Power Bratton (center). Bethel Seminary San Diego’s Distinguished Lecture Series welcomed Christian environmentalist Susan Power Bratton, chair of the Department of Environmental Science at Baylor University in Waco, Texas, to present a series of lectures this fall. Her final lecture, “Christian Environmentalism 101: Toward a Sustainable World(view),” addressed the question “Do religious ties influence environmental ethical responses?” Bratton began with an argument posed by the nation of China, which raised the question of whether or not it would make a difference if there were more Christians in the world, implying that Christians are not concerning themselves with pressing global issues—specifically issues regarding the environment. She addressed the appropriate “religious response” by citing Genesis 2:15, “The Lord God took the man and put him in the garden of Eden to work it and keep it” (ESV). Bratton concluded her lecture with a challenge to remain faithful to the Biblical charge of honoring God’s gifts. She proposed four implications: 1) Do not destroy—respect living creation; 2) Care for the entire community, the poor, the widow; 3) Affect no damage to neighbors and contribute to environmental welfare; and 4) Convey God’s truth to the local and greater community.